Arashiyama torokko station appears to melt into the scenery of Arashiyama. 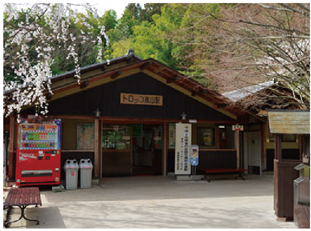 The path to the bamboo forest (well known as a filming location) is nearby, and visitors getting off the Sagano Romantic train can transfer to a rickshaw ride to enjoy a peaceful, luxurious trip through the town. If you feel the need to rest your feet, feel free to stop in the station for a breather. There are approximately 60 steps leading from the station to the platform. 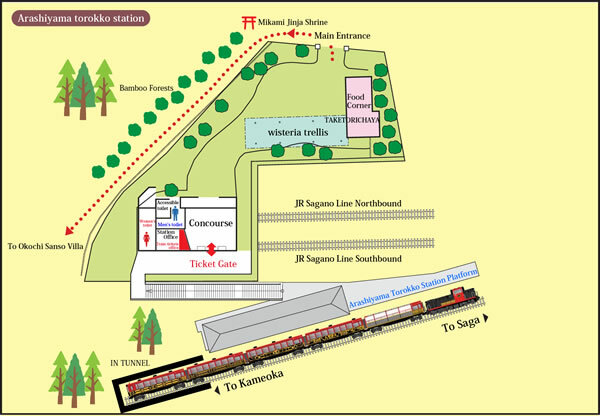 Visitors in wheelchairs or carrying walking sticks are encouraged to use Saga torokko station.